Germany, Pomerania. Bogislaus X, AD 1472 to 1523. 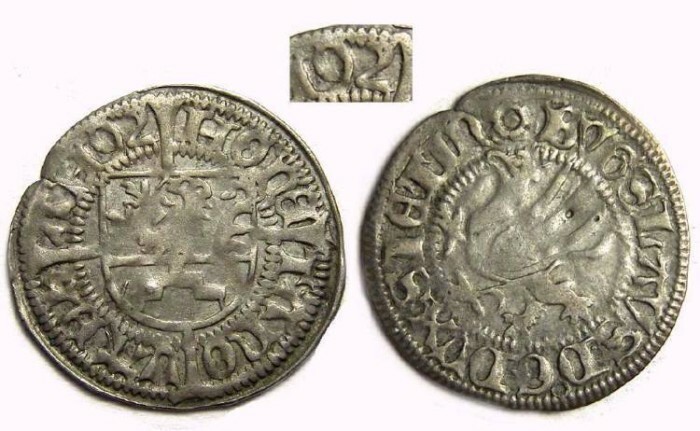 Silver Schilling DATED 1492. Denomination : Silver schilling. Mint : Damm. Date : 1492 written only as 92. See the inset image for the date oriented straight up and down. Size : 20.3 x 21.0 mm. Weight : 1.28 grams. Grade : VF but there is a tiny punch mark on one of the Griffin's wings. Obverse : Griffin left, with BVGSLAVS D G DVX STETIN around. Reverse : Arms of Rugen on a long cross, with MONETA NOVA DAM 92 around.